Is It Time To Rethink Judicial Selection In Arkansas? Nope. I am referring to yet another ugly political battle for a seat on our state’s highest court. Voters in the Natural State have elected judges for a very long time. Since 2000, when voters approved a constitutional amendment to remove partisanship from judicial races, these electoral contests have been nonpartisan. Arkansans generally like playing an active role in deciding who will fill these important positions. However, recent events lead me to expect more discussion from lawmakers, and voters alike, concerning whether or not reforms are needed to maintain the public’s esteem for the court. This year’s judicial race, for one of the Court’s Associate Justice seats pitted an incumbent member of the bench, Courtney Goodson against Department of Human Services Chief Counsel David Sterling. The race was actually a run-off from last spring’s primary and non-partisan judicial election. The contest was particularly negative in tone as at least one prominent outside group, The Judicial Crisis Network, spent well over a million dollars broadcasting advertisements against Associate Justice Goodson. The group(s) that provided the financial backing for these ads are often referred to as “dark money” organizations because such entities do not have to disclose their donors. In all fairness, another characteristic of these groups is that they cannot coordinate with a campaign, so these ads were not directly coming from David Sterling or his campaign team. While negative campaigning is not new to Arkansas politics, we had grown accustomed to relatively civil races for the judicial positions. Only recently has the negativity that so often plagues other electoral contests founds its way into these particular campaigns. Regardless of who you favored for these races, most of us see the need for our judicial system to operate above the fray of petty politics and close observers of the court often acknowledge the importance and value of this governmental branch maintaining such a public perception. Out of concern for the possibility of a tarnished perception brought onto the court by the increased role of money and politics, some have proposed different methods for selecting our state’s highest court’s judges. In previous meetings of the Arkansas General Assembly, legislation to alter judicial selection has been authored and submitted but failed to garner significant support. A few years ago, Representative Matthew Shepherd, a Republican from El Dorado who will serve as the Speaker of the House for the 2019-2020 Arkansas General Assembly, submitted legislation that would have begun the process of shifting from popular election of Supreme Court justice positions to an alternative form of judicial selection. More recently, Governor Asa Hutchinson expressed support for a system of judicial selection similar to what has become commonly referred to as the “Missouri Plan.” Under this method, a vacancy on the court is filled by the governor selecting a name from a list created by a commission. At the end of a trial period, the judge goes before the public in the form of a retention election—no opponent. According to the American Bar Association, seven states elect their judges to their state’s highest court by partisan election. Arkansas, along with 13 other states, elects their highest court’s justices in nonpartisan elections. 29 states have some version of an appointment process. Of those 29, 17 of them hold retention elections after the initial appointment. Will this most recent election cycle’s events lead to more support for alternatives championed by Representative Shepherd and Governor Hutchinson? Only time will tell. It is my opinion that prospects for such drastic change to judicial selection in Arkansas are doubtful. In all fairness, even a merit-based system such as the “Missouri Plan” would likely do little to stop the meddling of outside groups or even negative campaign tactics. However, the issue is as politically ripe as it has ever been and policy making relies heavily on windows of opportunity. The public mudslinging and “dark money” we have come to expect in practically all electoral races, except judicial contests, has finally reached the state’s judiciary. Perhaps it is time we rethink judicial selection in Arkansas. Being a professor of political science, I am often asked to offer my opinion on political events. I like to talk about politics, but I am even more interested in listening to the opinions of others. I often encounter people who express disgust for one or several aspects of our political system. One of the most common targets for their scorn is related, one way or another, to political parties. In this post, I offer my defense for that often loathsome yet necessary U.S. political institution we love to hate: the political party. More specifically, in this piece, I will explain the important roles parties play in our system of government. A political party is an organization comprised of people seeking the ability to govern. To govern, parties win elections by recruiting, nominating, and campaigning on the behalf of candidates who stand a chance at winning and are thought to share the same views of the party. While political parties are not mentioned in the U.S. Constitution, they have long been at the center of our politics. Political scientists typically agree the first political party system in the United States emerged in the early 1790s with the Federalists (think Alexander Hamilton and President John Adams) and the Democratic-Republicans (think Presidents Thomas Jefferson and James Madison). And while it is hard to imagine the U.S. without them, Americans have never liked political parties. George Washington himself spent more than a couple lines of his famous Farewell Address warning against political parties. 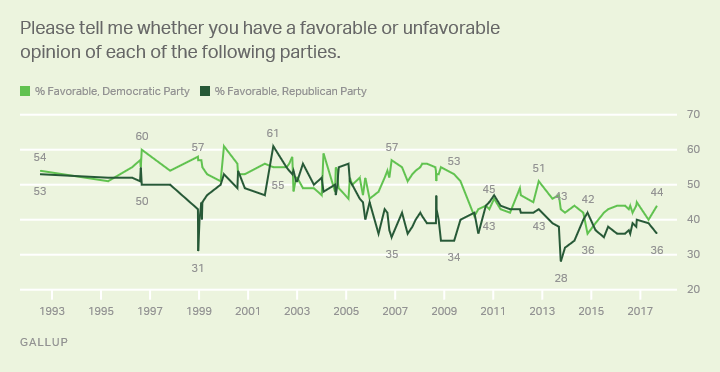 This tradition of disapproving of parties continues today as Gallup Polls regularly report approval ratings of both major parties below 50%. Despite our disapproval of political parties, they are a fundamental component of democracy. Governments such as our own require an active and informed electorate. We are asked to vote often to make decisions on policies and, more commonly, to elect individuals who represent us and make decisions on our behalf. Parties educate the electorate on issues and candidates—providing us with useful cues that allow us to better evaluate the actions of incumbents—those already in office—seeking re-election. Party identification provides a voter with a significant amount of information as she can better determine whether or not a candidate on her ballot holds similar views as her own. Parties also help us organize and stabilize the government. I know, given the current state of Congress, this is where I may lose you, but the mere existence of parties are not to blame for the polarization and seeming dysfunction in D.C. (a topic for another day). Parties are needed to organize the politics of a diverse country, and they build and maintain the fragile coalitions needed in government to get stuff done. It is important to remember that a political institution, such as the U.S. Congress or our state General Assembly, is—at any one time—addressing several complex and distinctly different issues. Parties provide those in government, just like voters at the ballot, cues about who they might be able to work with, moving forward, to address issues.